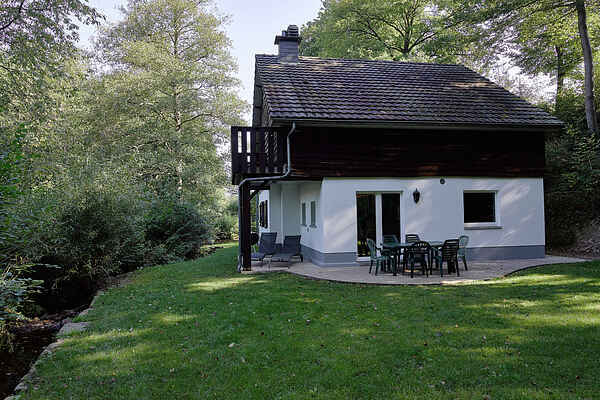 This lovely holiday home with sauna is located on the edge of a forest with a shallow stream. You're in the beautiful area of ​​Stoumont and the Coo waterfalls with its many panoramas. The living room has a nice sitting area that exudes a warm feeling with its lovely old fireplace. Here, You will also find the dining area, with dining table and glass sliding doors leading to the garden, which let a lot of light in. If you want to completely relax, then you go can go to the relaxation area with sauna and lounge chairs. In the unfenced yard, there's is a wooden hut and a swing for the children. Further, there's a terrace with barbecue, facing south, and a covered second terrace near the stream. The village of Rahier is 500 meters away and Stoumont 6 kilometers. You'll find wonderful hiking and biking trails that begin at the house. The region also offers many activities and attractions, including Coo (waterfalls, chair lift, kayaking, PlopsaCoo) Sunparks in Vielsalm, Stavelot (abbey, car museum), Spa (thermal baths, casino, golf). For winter sports enthusiasts, there are cross-country and ski slopes in the region. Our holiday houses are especially furnished to accommodate families.